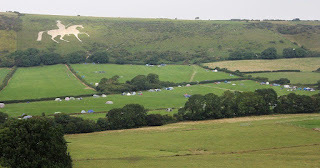 White Horse Campsite is located in Osmington, Dorset. We offer guests the freedom to pitch in each of our large fields, ensuring that you have the space and freedom to enjoy your stay. 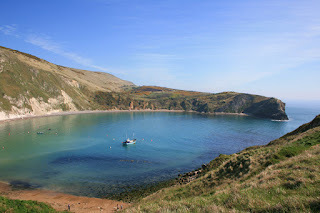 At the campsite we pride ourselves on offering a small slice of unspoiled country life and so despite demand we are unfortunately unable to accommodate more guests once we are fully booked. This ensures that all guests can enjoy a peaceful and relaxing break with all the space they need. With so much space at your disposal we encourage all guests to make themselves at home - settle in for an afternoon BBQ, grab a picnic and explore the great open spaces of the site. You can relax and enjoy the peace and tranquillity of this unique area. Upon arrival you will be able to book in a delivery of groceries from the farm. This includes bread, fresh milk, home baked croissants, farm fresh free range eggs, bacon, sausages, burgers, cold drinks and anything else you need for a BBQ. The campsite is named after The White Horse carving. High on a hill overlooking Weymouth Bay is the carving of King George III riding his favourite charger Adonis. The figure was carved out of the hillside in 1808 in honour of the King’s many visits to the locality, and it is the presence of the royal rider that makes this figure unique amongst its kind across the United Kingdom. Footpaths and bridleways on the farm allow you to explore the local area at your leisure, including the villages of Sutton Poyntz and Osmington. For those with an eye for simpler pleasures there are a number of local pubs to relax, unwind and sample some local produce. You can also find The Camping Directory on Facebook, Twitter, Instagram and Pinterest.